By day, I am a mild-mannered employee of a company that manufactures heating appliances. One of the ongoing challenges that we face is helping people understand how to compare the cost of heating with one fuel versus another. After all, natural gas is sold by the therm, heating oil and propane are sold in gallons, and electricity is sold by the kilowatt-hour. What people really want to know is: If I spend $1 on heating fuel, how much heat does that give me? Many service companies, especially those servicing oil equipment, will run a combustion analysis during the annual service. Often, the results of this analysis will be left on a printout or written on a service tag that’s attached to the heating appliance. This is a very good number to use. Newer equipment is required by law to have a label indicating either the cost to operate the equipment or the efficiency and its relation to similar equipment. You’ve have more than likely seen these yellow labels on new refrigerators, air conditioners, washing machines, heating appliances, etc. If an efficiency is given here, this is also a good number to use. With heating equipment in particular, this label shows the results of a specific test used to determine the Annualized Fuel Utilization Efficiency (AFUE). This number is not necessarily the same as the actual combustion efficiency of the appliance, as it takes into account factors such as standby losses, and is closer to the real world efficiency. If you are comparing your current system to a new system, then you’ll have to decide what efficiency system you will compare to. A new natural gas or propane fired system can range from 80% to as much as 95% efficient, but an oil fired system can only achieve a maximum of 86%. Electric resistance heaters are 98% efficient, but any kind of wood fired systems generally don’t get much better than in the high 70% efficiency range. The other variable is the pricing of fuel. I’ve found that I can pretty much find the cost of all major fuel types with some Googling. Natural Gas prices can be a little tough to find if you’re not already a customer, but with a little digging I was able to come up with a unit cost. With Natural Gas and Electricity, you have to be a bit careful in making comparisons if you are already a customer since there are often different rates for different types of service. Residential Heating is often the lowest rate available. When all else fails, a quick phone call to a local utility or service provider will be enough to turn up the going rate for the fuel you are comparing. The clear winner here is natural gas, since I have no desire to stoke a wood fired boiler, furnace, or fireplace. What are your thoughts? Have you considered switching fuels lately? How do prices in your area compare to these? Let’s hear your thoughts on this in the Comments Section below. This entry was posted on Tuesday, December 16th, 2008 at 10:07 pm	and is filed under Household, Planning, frugal. Both comments and pings are currently closed. so a question for you - which would be cheaper - keeping my natural gas heater at 68 degrees and using an electric space heater in DS’s small room at 72 degrees and one in my bedroom at 72 degrees or just to put the natural gas heater at 70 degrees for the whole five bedroom, two full bath two story home? Based upon what I am paying for pellets for my stove right now ($7 per 40lbs. )the BTU/dollar is 38,891. This is helpful and actually confirms something that I suspected -pellet stoves are no great bargain. It works for me only because of it’s location in my home if I use it strategically rather than as a primary heating source. The price of pellets went up substantially this past year along with heating oil. Heating oil has dropped again - but pellets haven’t so it isn’t a great bargain. I think many of the pellet suppliers were forced, due to demand, to pre-order very far in advance and are locked into pricing that must be passed on to the customer. Of course, my local supplier could just be ripping me off. Unfortunately I don’t have the space to order pellets in large quantities to take advantage of quantity pricing. One other consideration is convenience versus price. 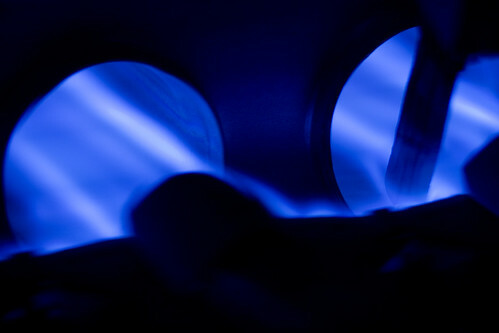 With natural gas, oil, and propane there is virtually no effort involved. Wood, coal, and pellets require quite a bit of time and energy to stock, monitor, clean, and maintain. If one were to quantify these efforts I am sure that this comparison would make these options much less attractive. Kimberly: Do you mean just at night or all the time? The answer to this really depends on the relative costs of electricity and natural gas in your area. By virtue of the fact that you have a central furnace fired by natural gas, I’m going to guess that gas is a lot cheaper to heat with than electricity. In my area, electricity is over 3 times more expensive to heat with than gas, and a 4 degree difference in room temperature isn’t going to use anywhere near 3 times more gas. My gut feeling on this is that natural gas is still going to be cheaper, but it’s hard to say without more information. Rick: Your conclusion is the same as mine which is why I think that natural gas is the real winner here. Propane was a lot more attractive earlier in the year when oil prices rose dramatically, but now that they’ve fallen again it’s not as much of a bargain. $7 for 40lbs is only ~17% more than the bulk rate, but it does seem like the per dollar heat rate is a lot lower. Great web site. A lot of useful information here. I’m sending it to some pals ans also sharing in delicious. And naturally, thanks on your effort!